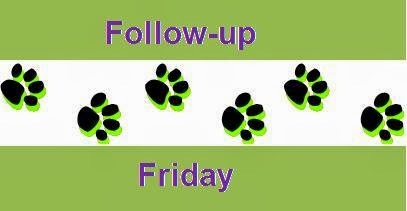 Once again we're joining Heart Like a Dog's Follow up Friday blog hop. Thank you Jodi, for inviting us all to join the hop that "lets you wrap up the week and leads you right into the weekend." We only have one update here tonight but it's a pretty big deal: Our auction has ended and we have a winner! In case you aren't following us on Facebook, we announced Monday night that our auction for the black diamond paw print pendant ended successfully and we have a winner. The necklace is on its way to a new owner who we hope will enjoy it and wear it with pleasure. The auction raised $102.50 USD and we promised to double match the amount. So Save a Sato will be receiving a donation of $307.50. in the next couple of days. Just in time for Christmas. We hope it helps and thank everyone for Tweeting and sharing and pinning and bidding. Please know you did an amazing thing for the dogs in Puerto Rico who are in so much need of care and a kind hand. Thank you. You have made my holiday. It's time for the Advent Calendar for Dog Lovers hosted by Kol's Notes, Heart Like a Dog, My Brown Newfies, My GBGV Life & Bringing Up Bella! 24 giveaways in 24 days, plus a grand prize worth more than $500 - who wants to win? Today's giveaway is sponsored by K9 Bytes. You could win a hand crafted whimsical leash & collar set. Click here to check out the Advent Calendar and enter today's giveaway! Congrats on a successful raffle! Oh I'm so glad the Sato foundation will benefit from your generosity!! What a great idea. Thanks so much for joining the blog hop, we love having you!! So I just opened my black diamond paw print pendant two days ago. I can't say I wear a lot of jewelry but my husband knew I'd appreciate the gift to the Save a Sato charity. I asked Mike if you knew he was the winning bidder and he said he didn't know since he didn't win it from you. He didn't pick up Jan's name on the ebay auction site. So thank you for allowing us to share in your gift. I did recognize who won and I hope you enjoy it. I didn't take you for much of a jewelry wearer myself but even I would wear this little one. And of course, the donation has been made (and matched) and will go so very far in helping the dogs in Puerto Rico where their resources are so limited. So thank you and thank Mike for such a generous gift to them.